[Faith and Endurance] Dear brothers and sisters, when troubles of any kind come your way, consider it an opportunity for great joy. For you know that when your faith is tested, your endurance has a chance to grow.4 So let it grow, for when your endurance is fully developed, you will be perfect and complete, needing nothing. This particular passage also reminds us that as we wait on the Lord, we are not to waiting in a state of anxiety, not in a state of doubt or fear, as we encounter fiery trials. Instead, the state in which we wait is the state of patience—we are patiently waiting. God promised good to us; His Word our hope secure. Lord, search us and know us—discern our motives are pure. But graduate with honors, at the top of our class. [Faith and Endurance] Dear brothers and sisters, when troubles of any kind come your way, consider it an opportunity for great joy. 3 For you know that when your faith is tested, your endurance has a chance to grow. 4 So let it grow, for when your endurance is fully developed, you will be perfect and complete, needing nothing. But let patience have her perfect work, that you may be perfect and entire, wanting nothing. A place of assurance that God alone is in control. While still running to serving the Lord as our life’s highest goal. Especially in the midst of great turmoil and unrest. God knows where we are at this time; nothing is by chance. In Christ we prevail despite any adverse circumstance. When our faith is tested, our endurance will also grow. We are perfected to stay the course and trust and obey. 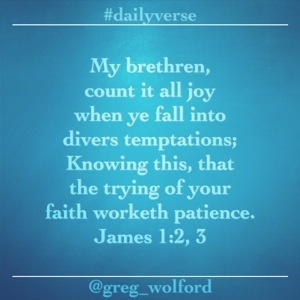 The expression “divers temptations” can be translated the testing or proving of your faith, In Romans 5:3 we learn that tribulation, another word for temptation, works patience, and patience experience. But graduate with honors, the first in our class. Knowing this, we can count it all joy when we encounter various temptations or fiery trials that test our faith and build patient endurance. While still running to serving the Lord as life’s highest goal. That in Christ we prevail despite each adverse circumstance. [Faith and Endurance] Dear brothers and sisters, when troubles of any kind come your way, consider it an opportunity for great joy. For you know that when your faith is tested, your endurance has a chance to grow. The Verse of the Day for January 20, 2015 brings to mind that as we wait on the Lord, we are not to waiting in a state of anxiety, not in a state of doubt or fear, as we encounter fiery trials. Instead, the state in which we wait is the state of patience—we are patiently waiting. Not too long ago, I heard a message entitled “A No Want State,” a life-altering teaching related to James 1:2-4. As I attempt to complete yet another test. Ever the eager student, I will do my best. You promised good to me, your Word my hope secure. Search me and know me—discern that my motives are pure. My soul now anchored in hope; in you I find rest. You are my light, even when times seem their darkest. To graduate with honors, the first in my class. While still running to serving the Lord as my life’s highest goal. God knows where I am at this time; nothing is by chance. In Christ I prevail despite any adverse circumstance. When my faith is tested, my endurance will also grow. I am perfected to stay the course and trust and obey.